The biomaterials market is projected to reach USD 149.17 Billion by 2021 from USD 70.90 Billion in 2016, at a CAGR of 16.0%. The growth of the overall market can be attributed to increased funds & grants by government bodies worldwide, the growing implantable devices market, technological advancements, rising number of hip and knee replacement procedures, and high growth in geriatric population coupled with growing incidence of cardiovascular diseases. This report segments the biomaterials market based on type of material, application, and region. On the basis of type of material, the metallic biomaterials segment is expected to account for the largest share of the global market, in 2016; owing to their unique properties such as biocompatibility, strength, and resistance to breakage, which makes them suitable for usage in various medical applications such as orthopedic, cardiovascular, wound healing, and dentistry. The polymeric biomaterials segment is projected to grow at the highest CAGR during the forecast period. This growth can be attributed to the increasing use of polymers in soft tissue applications such as plastic surgeries. In the coming years, the market is expected to witness the highest growth in the Asia-Pacific region. This can be attributed to factors such as rising cosmetic and plastic surgeries in India, lucrative medical device industry and new tax policy in China, growing number of cardiovascular diseases, increasing aging population, and rising volume of hip and knee replacement procedures in this region. North America is expected to account for the largest share of the global market, in 2016. Rising biomaterial-based research, increasing demand for plastic surgeries, increasing conferences on biomaterials, growing cancer incidence, and the rising prevalence of cardiovascular diseases are expected to drive market growth in this region. Some major players in the global biomaterials market include Royal DSM (Netherlands), BASF SE (Germany), Corbion N.V. (Netherlands), Covestro (Germany), Invibio Ltd. (U.K.), Carpenter Technology Corporation (U.S.), Evonik Industries AG (Germany), Berkeley Advanced Biomaterials, Inc. (U.S.), CAM Bioceramics BV (Netherlands), and Celanese Corporation (U.S.). The biomaterials market is projected to reach USD 149.17 Billion by 2021 from an estimated USD 70.90 Billion in 2016, at a CAGR of 16.0%. The growth of the overall market can be attributed to increased funds & grants by government bodies worldwide, the growing implantable devices market, technological advancements, rising number of hip and knee replacement procedures, and high growth in geriatric population coupled with growing incidence of cardiovascular diseases. The global biomaterials market is segmented on the basis of type of material, application, and region. On the basis of type of material, the global market is segmented into metallic, ceramic, polymeric, and natural biomaterials. In 2016, the metallic biomaterials segment is expected to account for the largest share of the market. The metallic biomaterials segment is further divided into stainless steel, titanium & titanium alloys, cobalt- chrome alloys, gold, silver, and magnesium. In 2016, the stainless steel segment is projected to account for the largest share of the metallic market. The titanium and titanium alloys segment is expected to grow at the highest CAGR during the forecast period. The polymeric biomaterials segment is projected to grow at the highest CAGR during the forecast period. Polymeric biomaterials are further segmented into polymethylmethacrylate (PMMA), polyethylene, polyester, polyvinyl chloride, silicone rubber, nylon, polyetheretherketone (PEEK), PLA, PGA, and PLGA, and other polymeric biomaterials. The PMMA segment is expected to grow at the highest CAGR during the forecast period. On the basis of application, the biomaterials market is segmented into cardiovascular, orthopedic, ophthalmology, dental, plastic surgery, wound healing, tissue engineering, neurological/central nervous system, and other applications. In 2016, the cardiovascular segment is expected to account for the largest share of the biomaterials market. The plastic surgery and wound healing segments are expected to grow at highest CAGRs during the forecast period. 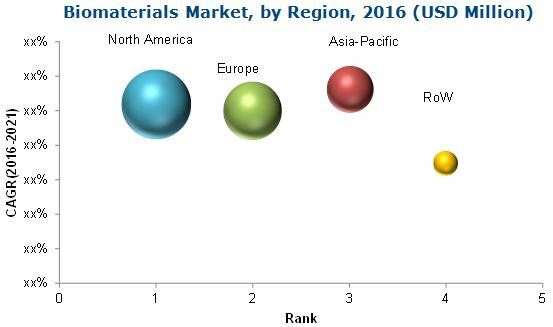 The biomaterials market is segmented into four major regions, namely, North America, Europe, Asia-Pacific, and the Rest of the World (RoW). Among these regional segments, North America is expected to account for the largest share of the global market, in 2016. However, the Asia-Pacific region is expected to grow at the highest CAGR during the forecast period. The high growth in this regional segment can be attributed to the rising aging population and increasing incidence of cardiovascular and orthopedic diseases in India and China. Prominent players in the global biomaterials market include Royal DSM (Netherlands), BASF SE (Germany), Corbion N.V. (Netherlands), Covestro (Germany), Invibio Ltd. (U.K.), Carpenter Technology Corporation (U.S.), Evonik Industries AG (Germany), Berkeley Advanced Biomaterials, Inc. (U.S.), CAM Bioceramics BV (Netherlands), and Celanese Corporation (U.S.). 5.2.2.2 Unfavorable Healthcare Reforms in the U.S.
9.2.1.1 Biomaterials-Based Research in the U.S.
9.2.1.2 Growing Demand for Plastic Surgeries in the U.S.
9.2.1.3 Conferences and Symposiums on Biomaterials in the U.S.
9.3.2.2 Rise in CVD Prevalence in the U.K.
9.3.2.4 Rising Volume of Cosmetic Surgeries in the U.K.
11.9 Berkeley Advanced Biomaterails, Inc.
Table 132 Conferences and Symposiums on Biomaterials in the U.S.
Table 142 Conferences and Symposiums on Biomaterials in the U.K. Figure 20 Regulatory Approval Timeline in the U.S.